Do you find yourself having to juggle back and forth between preparing nutritious shakes for yourself during the whole week and for everyone else during the weekend? Having an all-in-one blender that could easily accomplish either task and not end up costing you an arm and a leg would be a dream, wouldn’t it? Well stop dreaming and keep your eyes peeled to the screen as we’re about to introduce you to Ninja’s BL660, the best mid-range blender around. It looks powerful and the angular lid is nice, but other than that the blender is bland. Standard selection of settings and a pulse function that responds to the slightest touch. The controls are self-explanatory and swapping the jars is easy. Both the blender’s internal components and accessories are made from quality materials and it should run without issues for years. Overall a fairly priced smoothie maker for both single servings or smoothies for the whole family! The BL660 was created for people who demand top-notch versatility from their blender, whether it comes to the types of drinks it is capable of making or the size of its portions. ...the BL6600 is a reasonably priced blender that ought to satisfy all of your smoothie or salsa-making needs. It does take up quite a bit of space on your counter though, so if it’s already cluttered with other appliances or small enough as is, you may want to go with a slimmer model. The contents of the BL660’s packaging reveal a great deal about how diverse it is. You get an absolutely massive 72-ounce lidded jar, two smaller 16-ounce bullet-style jars, two travel lids, and separate blades used with the bullet jars. 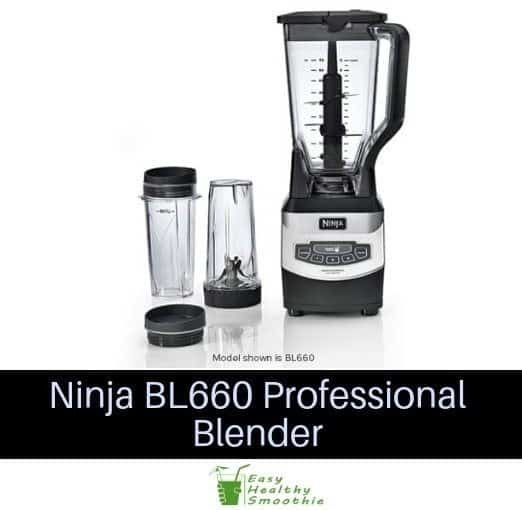 Ninja wants guests who visit your kitchen to notice this blender, and they certainly will thanks to its large size. While its style isn’t nearly as appealing as that of, say, the NutriBullet, the two tones and clean interface along with the massive rectangular jar make the BL6600 feel at home in any kitchen. Let’s just hope that Ninja will make their logo a bit smaller on future models. Whether you need big portions or small, you’ll be buying this blender for its exceptionally powerful motor. With a peak strength of 1,100 watts, it can literally crush ice cubes into snow with a few short pulses. This also means that you can blend whole pears or apples and get a smooth, consistent shake that’s jam-packed with fiber and nutrients. The large 72-ounce jug is the star of any morning family get-together. You can prepare enough smoothies for four people and still have some left over. It has a sturdy handle for easier pouring and its side is clearly marked for precisely adding ingredients. The smaller jars hold a respectable 16 ounces and have plastic lids so you can save some for later. Using the BL6600 couldn’t be much easier. There’s a power button, three speed settings, and a pulse function for when you need to mix something up in seconds. To do that, the blades need to be both sharp and well placed given the size of the main jar. Luckily Ninja has outfitted it with three sets of razor-sharp stainless steel blades which extend more than high enough to chop everything inside the jar up uniformly and give it a creamy consistency. To get to that smoothness though, you’ll need to crank the motor to its highest setting. Even then the results may not always be devoid of texture, especially if you’ve put hardier leaf greens into the mix. For best results, you should make green shakes in the bullet jars. Even if you aren’t challenging the BL6600 with frozen kale, getting to a point where seeds and skins can’t be felt anymore takes somewhat longer than with other albeit more expensive blenders. The jars and their lids are all dishwasher safe. You’ll have to clean the blades manually, which isn’t much of a bother since food rests tend to slide right off of them if you’re cleaning up straight after making a drink. They really are sharp though, to the point that Ninja should put a warning somewhere to prevent people from cutting themselves, so caution when washing them is advised. People often either buy the cheapest appliances possible and, unsurprisingly, get underwhelming results, or they purchase top-of-the-line product and spend good money on features they’ll probably never use. Ninja’s BL6600 offers a middle path – it’s affordable enough to feel like a definite step up from bargain bin models, while making shakes and smoothies at the level of considerably more expensive ones. Provided you don’t mind a grittier taste when drinking leaf green concoctions and have more than a minute to devote to smoothie making each time, the BL6600 has next to no faults. It is absolutely one of the best mid-tier blenders available today, and that’s not likely to change any time soon.